Newsweek provides a fascinating interactive visualization that compares the rankings of the world’s best countries by economy, politics, health, and quality of life. One of my favourite bands, Arcade Fire, has collaborated with Google and writer/director Chris Milk to create an experimental video for their song “We Used to Wait”. Made to play in Google Chrome, The Wilderness Downtown starts off asking for the address of your childhood home and then becomes in an incredible audio and visual experience that uses choreographed browser windows of varying sizes popping open or closing and displays animations of digital flying birds flying from one window to the next and a pair of feet running along a street. All of that builds up to a climax when images of your street and childhood home are blended into the video, creating moments of surprise, delight and nostalgia. Self-reflection and sentimental thoughts are triggered near the end with pause allows you to write a message to your younger self, after which animated trees sprout all along your old street. Using HTML5 technology, the collaborators have created a technologically impressive and creatively piece of work to create an awe-inspiring audio/visual experience. A fun tag cloud of my delicious tags. Generated by Wordle. 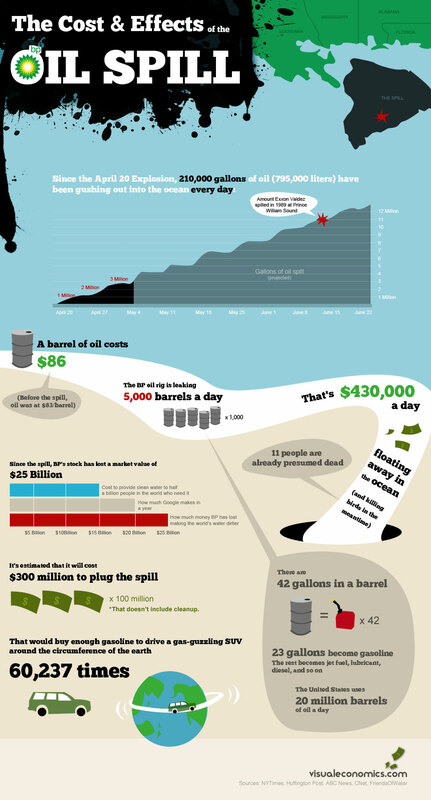 Interesting visualization of the tragic oil spill. Also, check out Boston.com’s The Big Picture for imagery of the devastation. A humourous, yet useful guide to selecting a typeface. Charting the Beatles is an ongoing project exploring the music by the Beatles through infographics. The series of visualizations take data from secondary sources like sales statistics, biographies, recording session notes, sheet music, and raw audio readings to illustrate the song keys of each album, the band’s working schedule, and the ways in which they self-reference their songs, etc. They’re really beautiful and draw you in to read the all the details. This detailed tracking reminds me of Feltron‘s data-tracking of his everyday routines. Via information aesthetics. For the past few weeks I have been thinking about memory as my thesis project aims to design around memory recording, sharing, and recollection. Thus, it was quite interesting to read that scientists have just recently captured images of memories being formed at which point new proteins are created at brain synapses. This provides a step forward in helping to understand the mechanism of long-term memory as well as the memory-related diseases and impairments.